HomeHealthy, Organic Chocolate Covered Strawberries – YUM! Looking for a tasty, romantic treat for your sweetie this Valentine’s Day? Look no further! These chocolate covered strawberries are not only delicious but also healthy! Strawberries are packed with antioxidants, vitamin C, and abundant minerals. Dark chocolate has one of the highest ORAC values of any food ever tested, and is heart-healthy and good for the brain. Perfect Coconut Oil provides beneficial fatty acids, rounding out this dessert with a nutritional boost. 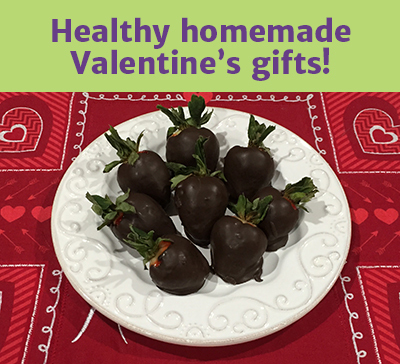 Present a pretty plate of these chocolate covered strawberries to your Valentine with a card and a kiss! Wash strawberries, dry well, and set aside. Melt chocolate chips in a double-boiler or in the microwave on 50% for about two minutes. Add the coconut oil , stirring until the chocolate mixture is smooth. Dip strawberries one by one into the mixture, twirling each one for an even coating, and lift to allow any excess chocolate to drip off. If desired, roll the covered strawberry in some chopped nuts or shredded coconut. Place finished chocolate covered strawberries on a parchment-lined baking sheet until the chocolate hardens, about 30 minutes (refrigerate or freeze to speed the process along!) Store in the refrigerator for up to two days. If you have leftover melted chocolate, scrounge around in your kitchen for fruits, nuts, and other creative choices to dip. 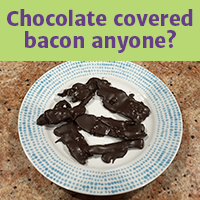 We even made chocolate covered bacon… Weston A. Price would be proud! ← Eating your greens is so much easier with Perfect Fermented Kale!